R.C. Hall is shown here surrounded by his four children. 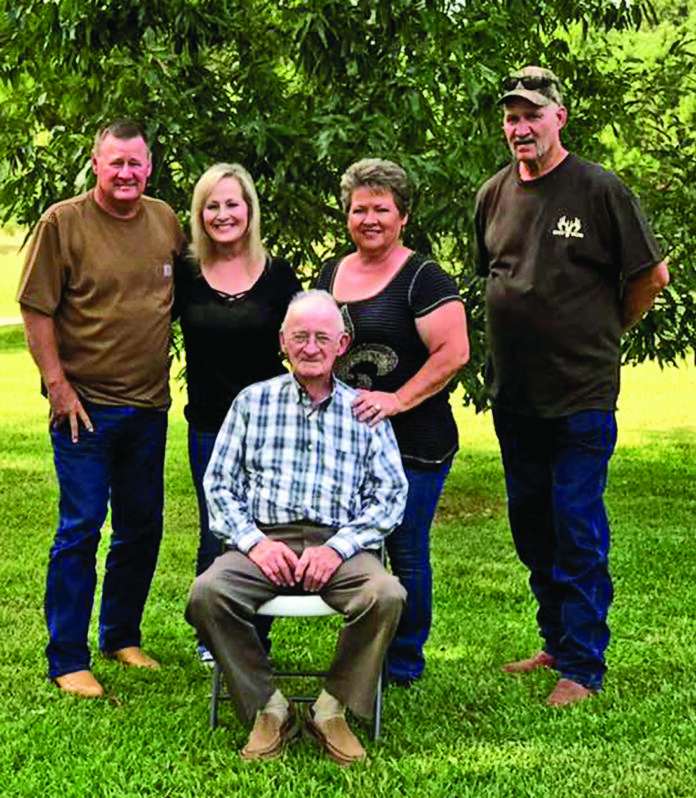 From left are Danny Hall, Neice Hall Masterson, Cathy Hall Humphries and Randy Hall. They hosted a surprise 90th birthday party. R. C. Hall was born Oct. 7, 1927 to R.L. and Allie Hall at their home in Robeline. R.C. was the oldest boy of eight children: sisters Claudie Lee Hall Bryant, Sadie Mae Hall Bryant, Carmel Hall Goodrow, Odell Hall Berry and Helen Hall Starnes and brothers Willie David Hall and Leroy Hall. On Sunday Oct. 1, 2017, R.C. was given a surprise birthday party at the home of his son, Danny, and his wife Pat, of Marthaville. R.C. married his sweetheart, Hattie Mae Berry Hall, on Aug. 15, 1952 at the home of her parents, Clifton and Mattie Berry of Robeline. They were married by Bro. Clarence Berly of Marthaville. Witnesses to their marriage were his dad R.L. Hall and Lawrence Henderson of Robeline. R.C. and Hattie Hall became the parents to four children, Randy (wife Betty), Danny (wife Pat), Cathy and Neice (husband Joe). R.C. now has eight grandchildren: Misty Hall LaBorde, Shawn Hall, Phillip Dowden, Wesley Dowden, Luke Dowden, Tiffany Masterson Robinson, Cliff Hall, Ashely Masterson Hammerbeck; 19 great grandchildren, Alexis Rowe, Hadelyn and Lydia Hall, Zack and Mason LaBorde; Mia, Miller and Madden Dowden; Ashlynn and Joseph Fiske, Hannah Robinson, Myleigh Hinds, Bella Masterson and Lillian Hammerberk; Ashton Dowden, Ally and Abby Beasley; Kaylee and Kayslyn Hall. R.C. attended school in Robeline and as a young boy . picked peaches for 25 cents a day. In the early 40’s, R.C. drove a lumber truck and drove a dozer for Robert Chandler of Robeline for $35 a week. R.C. went to the oil field in the 60’s in the Gulf of Mexico working for Reading and Bates. He worked there until he retired in 1987. Some things that went on in the year of 1927, 90 years ago, were Calvin Coolidge was president, Oramel H Simpson was governor of Louisiana, gas was 21 cents a gallon, milk was .56 a gallon, Eggs was .46 cents a dozen, stamps were 2 cents each, you could buy a house for $7,682 and a Ccr for $375. Average income a year was $1,472, the Harlem Globetrotters played their first game, 7-Eleven was founded in Texas as Tote’m Stores, the Great Flood of Louisiana was in 1927 and the birthday man his self was born, R.C. Hall. Happy 90th Birthday!